I had some of the most luscious ravioli I have ever tasted thanks to Pasta Mia. Enrico Sentatore, the corporate buyer for Pasta Mia worked with photographer Ryan Beck and me to create a new photo for their Salmon Ravioli with Asparagus and Grana Padano Sauce. Enrico walked into the studio with a cooler full of fresh ingredients: a full side of beautiful fresh iced Atlantic salmon, a huge pound wedge of Grana Padano cheese, a fistful of fresh parsley, a huge bag of ravioli, and three containers of Grana Padano Sauce. I picked up fresh asparagus at the market on my way to Ryan's studio. We had everything we needed to create a new packaging shot for Pasta Mia. 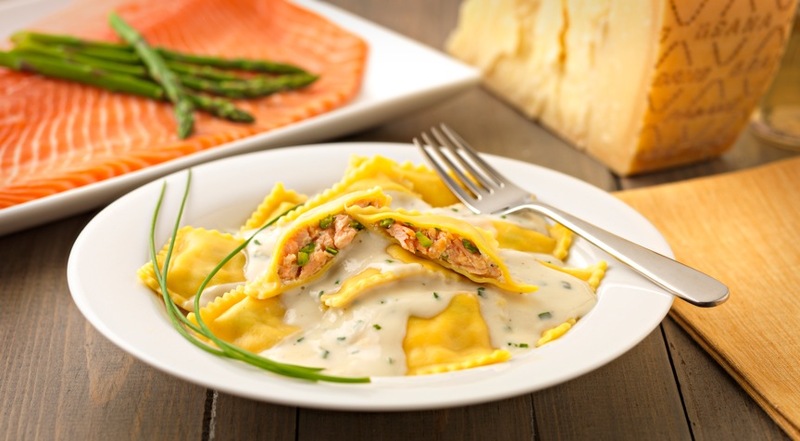 The pasta is golden yellow because of the egg yolks and the filling is made from flaked salmon, fresh whole mik ricotta, and tender asparagus. By handling, cooking, and tasting the product it was easy to see the high quality standards that are so important to the company. Enrico told me they try to source the very best ingredients locally, but if they can't find a product that meets the their criteria, they will import it from Italy. I believe the huge wedge of Grana Padano was from Italy. Currently most of their wonderful pastas and sauces are served in upscale resaturants, but I was happy to find out they are expanding their line into the retail marketplace and we will be able to find it in Costco shortly. Because I'm such a lover of food history, I did some online digging before I met Enrico. I wasn't familiar with Grana Padano and wanted to know more about the cheese. Turns out, it is one of the best loved cheeses in Italy. It's also one of the world's first hard cheeses, created nearly 1,000 years ago by the Cistercian monks whose life focus is on manual labour and self-sufficiency. Many abbeys have traditionally supported themselves through activities such as agriculture and brewing ales. The monks used ripened cheese as a way of preserving surplus milk. By the year 1477, it was regarded as one of the most famous cheeses of Italy. It lasts a long time without spoiling, sometimes aging up to two years, and is made in a similar fashion to Parmigiano Reggiano. It is a semi-fat cheese that is cooked and ripened slowly, for at least 9 months or up to 20-24 months for the fullest flavor to develop. There was an extra added pleasure to this photo shoot that I should mention, I got to listen to the magnificient music of the Italian language all day. Even though I couldn't understand a word Enrico said in conversation on his cell phone, I listening to the melodic flow of the words. I completely understand why Elizabeth Gilbert in Eat, Pray, Love absolutley had to learn Italian.